There are several storms mentioned in the Bible, but only one is named. That one is Euroclydon, which translates to "typhoon." It's the one that Paul sailed through thinking there was no chance for survival (Acts. 27:20). What do we do when a typhoon hits our lives? Storms sure show us the stuff we're made of. If we've been stuffing issues rather than deal with them, this will be the time they all break lose. When a typhoon hits your life, you are totally out of control and you know it. It's definitely an "in your face" time of life. I've had a number of health issues over the years which is what got me into natural health. I had previous health problems that weren't dealt with too well in the medical system, so I was very open to a natural approach, especially since I'd been brewing teas for my husband's migraines and seen how effective they were for him. I can't get something nasty beyond my eyes and nose, so I preferred capsules. We reap the consequences of bad behavior allowing the devil to sift our lives. It doesn't make us bad kids. Job was considered a righteous man, but he had a lot of pride and he was very anxious about his children. We open doorways for the devil when we don't keep our minds renewed in Christ and aligned with His Word. Sometimes we can find our way around the symptoms of health issues with drugs or supplements, but the issues within will continue to wear away at our bodies if we don't deal with them. I've always liked being busy and loved checking off one task after another. It was part of my personality. Under it all I knew that God wanted me to slow down. My dad told me to slow down, my husband told me to slow down, and some of my friends were a bit overwhelmed with my activity, but I believed it was "who I was." Or was it!? I wrote an article called Walking Like Jesus years ago because there was always this "little voice" that was telling me to slow down. As long as I could keep on keeping on, I didn't slow down. Somewhere inside of me I knew that even I wasn't enjoying the rush-rush pace any longer and I began longing for more peace. Sometimes it's only ourselves that keeps us from having peace, although I blamed the demands of the world around me. Yet, I could see many people not bow down to it and I wanted to know how to get there. God is always faithful. He'll guide us if we allow Him. The storms in life reveal whether we're connected to God or not. Like Paul on the ship, I had to toss a lot of stuff overboard. When we moved to Virginia we downsized to 2/3 of the space we had to a house with less than 1600 sf. I've always loved being a good steward of what I owned, so keeping house here in VA has been a whole lot easier with all that less space and stuff. I'm not one to store it all in the attic, so what we couldn't fit in we gave away. Recently I've had to throw my job overboard also. I began the business 25 years ago so it was definitely a part of me, but it was a part that kept me from being well. I was too distracted with business to take time for me. Taking time for me has always been a challenge, but it's becoming a fun thing to do. It's like having a girl day every day and after only one month I'm settling into the idea. When my mind completes its adjustment, my body will follow. I have more time to be in touch with the Lord also, since my mind isn't busy about business. My spirit is excited at what God can accomplish.when I walk in obedience. I heard Him telling me to get out of the business 6 years ago and over time I did get out of a lot of it, but partial obedience is still disobedience. God's mercy endures forever, but our bodies do not. Now that I have obeyed entirely, my spirit can rejoice and there is a freedom of heart and mind that I was not experiencing before. Do you have a typhoon in your life? God can take it away if you'll yield and toss some stuff overboard and pray for His will in your life. Then when you get to shore, like Paul, you will be amazed at what God does with your life. Paul shared the gospel with the people of Malta and when it was time to leave, the people honored them and provided all the supplies they needed. God does provide for us in ways that will amaze you, but just like with our own children, we cannot reward bad behavior and God will do no less. It's incredible to me how many blessings we continue to have in our lives even when we walk in disobedience in one area. You're not a victim of your circumstances. Take time away with the Lord, as much as you can arrange with your commitments. He will tell you which way to go. Hearing is really the easy part ... obeying what you didn't want to hear is the challenge. Your future is not in the hands of others, it's in the hands of God and He will take care of what He owns, if you will turn ownership of yourself over to Him. Truly make Him Lord of your life and get out of the typhoon. 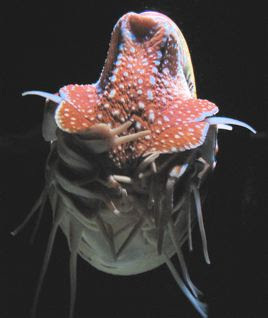 The nautilus can withdraw completely into the shell, and even close a hood, or it can extend 90 sensor-laden tentacles to detect and catch tiny crustaceans. In the center of the tentacles, the beak rips food apart before swallowing. Efforts are underway around the world to protect this sea creature by discouraging the sale of its shells.